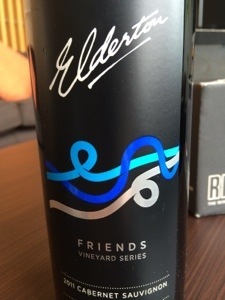 I was intrigued by this bottle having never seen the Friends series before from this producer. They had a Shiraz as well but I was not in the mood. It priced out at $15, what the heck. Atypical of Cab for me it had a unique flavor profile. Black and blue fruits on the nose with a touch of cedar. On the palate dark fruits, bramble and some dust (in a good way). Sour cherries on the back end with gentle tannins and good acidity make this easy to drink. 3-5 years cellaring and a wide variety of foods make this a versatile wine. 88 points and 3 stars.